General: The name Lågøya means ‘Low Island’ and is descriptive. 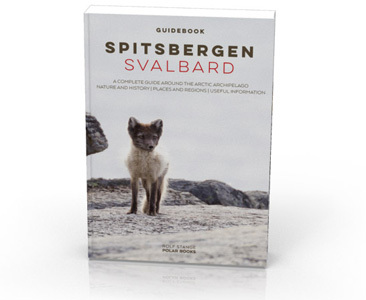 The west side of Lågøya including the northern tip, Purchasneset, is seasonally protected: it is not allowed to go on shore or to approach within 300 metres from the coast (including offlying rocks) from 15 May to 15 August. Lågøya, ‘low island’. Nordaustland in the background. 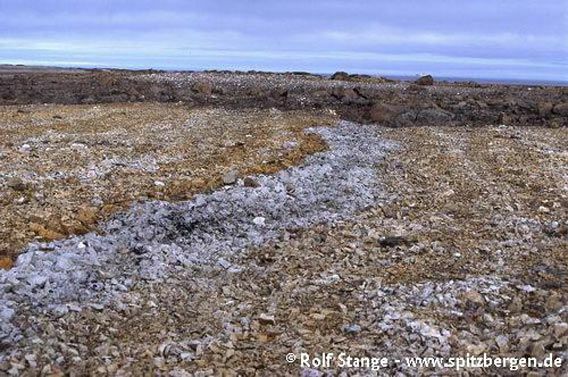 Geology: Mostly deformed, non-metamorphic sediments (quarzites and subordinate carbonates) belonging to the basement (younger Proterozoic), similar to Sorgfjord, Murchisonfjord or Lomfjord areas (northern Hinlopen Strait). Partly dolerites (upper Jurassic Cretaceous). Colourful stripes of various quarzites and dolostones. Landscape: Mostly flat, low hills and some smaller and larger lagoons and lakes. The steeply dipping, multicoloured quarzites forms nice, colourfull stripes in places, which have sometimes been reworked to rosette-like structures. The beaches are covered with driftwood and, unfortunately, plastic trash brought up there by currents. 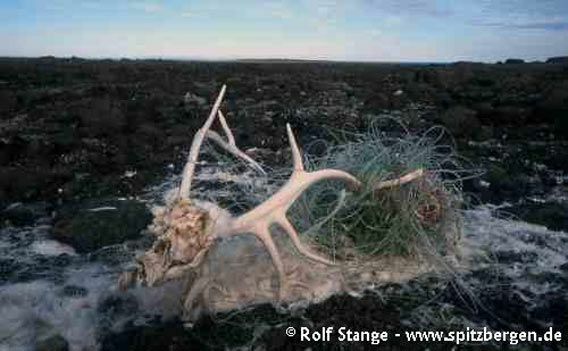 Remains of a reindeer that got entangled and then died a slow death in an old fishing net on washed up on the beach. Lågøya. 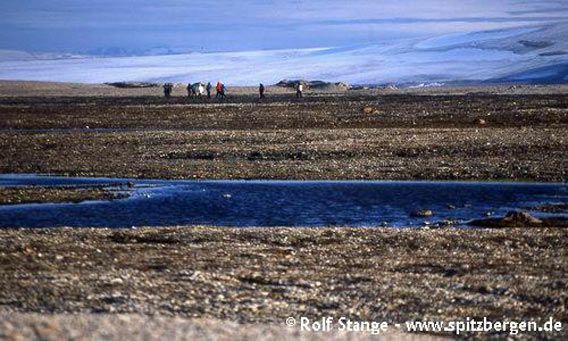 Flora and Fauna: Lågøya is very barren, vegetation is very scarce. Sometimes there are Grey Phalaropes at the lakes and Common Eider ducks at the coast. The Sabine’s Gull has one of very few breeding site in Svalbard on Lågøya. Often, there are walrus, usually in small numbers. 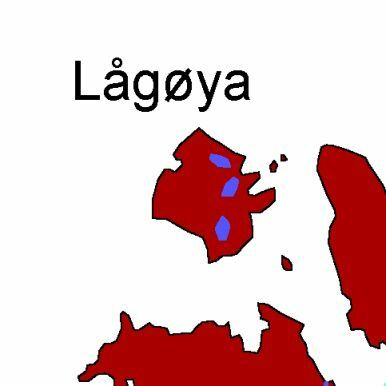 History: Lågøya has rarely been visited. 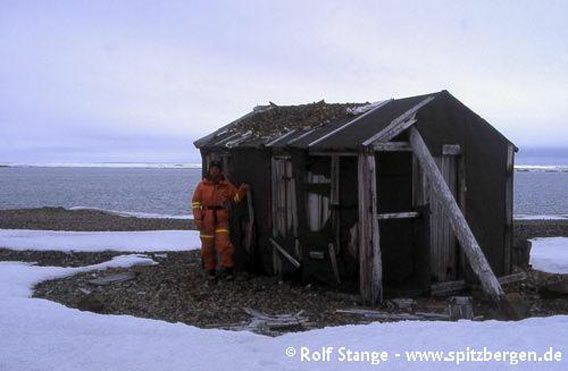 Occasionally, Norwegian trappers wintered here in the early 20th century. Hut in Mollbukta, east coast of Lågøya.